For now, at least, the new "Radio 92.1" appears to be running jockless ("more music, less yada yada"), but it's got an experienced format veteran at its helm: Shamrock operations manager Willobee has programmed this music before at stations such as Vermont's WEQX. As for the other half of the old "Cool 92 and 100" simulcast, WQFN (100.1 Forest City), it's now carrying ESPN Radio in tandem with Shamrock's WEJL (630 Scranton)/WBAX (1240 Wilkes-Barre) and their FM translators in both cities' downtown areas. The WQFN signal extends the ESPN programming northeast to the Carbondale area; meanwhile, its former downtown Scranton translator on 100.5 is now carrying the WFUZ modern rock programming. *Speaking of Family Life Network, it's getting two more FM signals in western Pennsylvania and nearby in upstate New York: the FCC has granted it construction permits for 89.9 in Cambridge Springs, near Meadville (8 kW/335') and for 89.3 in Silver Creek, NY, just off the Thruway between Dunkirk and Buffalo (17 kW/108'). The Silver Creek signal would reach at least the southern fringes of the Buffalo market, as well as providing a strong FLN signal to Dunkirk/Fredonia. *There's a new PD coming to Max Media's trio of "BIG Country" stations in central Pennsylvania, WYGL-FM (100.5 Elizabethville), WWBE (98.3 Mifflinburg) and WLGL (92.3 Riverside). Dawn Marie, who's been the stations' PD and morning co-host, is moving on to Cape Girardeau, Missouri to be operations manager at Max's cluster there - and that created an opening for veteran PD Rick "RJ" Jordan to fill. RJ has been up here in the Rochester area for the last few years, most recently working in promotions for Stroudavarious Records and Golden Records Nashville, but he's got a long resume in country radio, including PD stints at WBBS in Syracuse and WPOR in Portland. He starts at "Max" a week from today. In Lancaster, Franklin and Marshall College tells the FCC it needs a few more months to complete the construction work on the building where WFNM (89.1 Lancaster) usually has its antenna; it's now expecting WFNM to be able to return to the air by mid-December. *In NEW JERSEY and DELAWARE, the FCC is taking comments on what promises to be an interesting auction for two new commercial VHF DTV allocations. The Commission allotted channel 4 to Atlantic City, NJ and channel 5 to Seaford, DE after PMCM (a sister company to New Jersey's Press Communications) applied to move two rural western TV stations to New Jersey and Delaware to meet the statutory requirement that compels the FCC to provide commercial VHF channels in both states. While the Commission (and much of the broadcast community) questions whether the VHF rule was ever intended to apply to the DTV era, when VHF (especially low-band VHF) is of questionable value compared to UHF, it's still moving ahead on an auction for those two new channels. Designated "Auction 90," bids will begin to be taken February 15, 2011. The Commission is proposing a $200,000 starting bid for each of the channels. Unlike PMCM's proposals, which would effectively have created a new channel 3 in New York City and a new channel 2 in Philadelphia, the FCC's proposed channels won't provide much chance of big-city coverage, though the Atlantic City channel may at least be able to assert cable and satellite must-carry in Philadelphia. As for PMCM's appeal of the FCC's initial denial of its applications to move its stations east, the auction announcement says that will be dealt with separately; it's also promising a separate resolution to an appeal from the Broadcast Maximization Committee, which opposed the Seaford allocation on the grounds that it conflicts with the BMC's still-pending proposal to reuse TV channels 5 and 6 for radio. *Speaking of radio, and of Press, the format swap between "Thunder Country" WKMK (98.5 Ocean Acres) and "Hits 106" WHTG-FM (106.3 Eatontown)/WBBO (106.5 Bass River Township) went off on schedule at 3 PM on Wednesday (Sept. 15). The WKMK calls moved up the dial to 106.3, marking that facility's first call change in its nearly half-century on the air; the WHTG-FM calls are now on 98.5, though it seems likely that there will be one more call swap to put the WBBO calls on 98.5, matching the revived "B-98.5" imaging there. TOWER SITE CALENDAR 2011 - JUST ABOUT HERE! The production process was a little more complex than usual for Tower Site Calendar 2011, but at long last we're about to begin shipping the tenth installment in what's become an annual radio tradition. In just a few days, the new calendar will be back from the printer, complete with more than a dozen exciting new images including that nifty cover shot of Mount Beacon, N.Y.
And if you order now, you'll still be at the top of the list to get your 2011 calendar shipped to you next week! *On a relatively quiet week in NEW YORK, we begin with a format change in Binghamton, where Clear Channel quietly flipped WBBI (107.5 Endwell) from classic rock "107.5 the Bear" to classic hits (don't say "oldies!") at midnight Wednesday. The flip means Binghamton now has two old- er, "classic hits" stations, since Big is competing directly against Equinox's "Cool 100" (WCDW 100.5 Susquehanna PA). *In New York City, it's "Bob Grant Day" at WABC (770), where the venerable talk host will mark his 40th anniversary on the air in the Big Apple with a special 10 AM-noon broadcast hosted by Mark Simone and featuring appearances by most of the rest of WABC's talkers. Back here in Rochester, Clear Channel's cluster makes a big deal out of the local history that still lives up there on the 17th floor of the HSBC Building, and last week they added to that history by naming two of their conference rooms after veteran Rochester radio people. 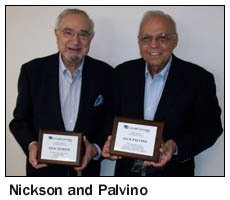 One of them is now "the Jack," named for longtime personality and former WVOR (100.5) co-owner Jack Palvino; the other is "the Nick," named for legendary WBBF jock and longtime Clear Channel salesman Nick Nickson. *In TV news, Buffalo-market WNGS (Channel 67) has flipped its main channel, 67.1, from Daystar religion to ThisTV (the national service that shows old movies and classic TV shows) now that the FCC has approved the station's sale from Daystar to ITV of Buffalo, the commercial entity controlled by Philip Arno, the long-ago co-founder of WUTV (Channel 29). ITV originally counted another Buffalo independent TV pioneer, Don Angelo, as a co-owner, but Arno tells the Buffalo News that Angelo is no longer involved with the station. The $2.75 million deal includes a clause giving Daystar the rights to WNGS' 67.3 subchannel for the next ten years. *Radio People on the Move: Former WCBS-FM (101.1 New York) chief engineer Mike Erickson has landed a new job down south: he's joining the staff of North Carolina-based Wheatstone, where he'll be working on their Vorsis line of audio processors. While we'll miss him up here in the northeast, it's no secret that audio processing is Mike's passion - and we're excited to see (or rather, hear) what he'll accomplish with Wheatstone/Vorsis. And we're sorry to note the passing of Jim Walsh, who (along with Glen Von Calio) bought the former WSNY (1240 Schenectady) in 1975, flipping it to WWWD ("3WD") and later adding FM station WVKZ (96.7 Clifton Park). Walsh served as the stations' general manager for almost two decades before selling them in the mid-90s. Walsh died Sept. 13 after a long illness; he was just 62. *Eastern MASSACHUSETTS wasn't slated to get a Catholic radio station until the end of October, but the deal to sell WBIX (1060 Natick) to Holy Family Communications moved ahead of schedule - and so last Wednesday night (Sept. 15) marked the end of business talk on WBIX, followed (after a few hours of silence) by the launch of Catholic programming under new calls WQOM. Alex Langer's sale of WBIX is valued at $1.5 million - $1 million in cash, plus $500,000 as an in-kind gift to Holy Family. *If you're called "Rush Radio" and you're struggling in the ratings, what do you do? You add more Rush, of course - and that's just what WXKS (1200 Newton) is doing, plugging an hour of Rush replays into its schedule from 6-7 PM weeknights. The extra hour of Rush knocks out the first hour of the Jason Lewis show from Minneapolis. Over at talk competitor WRKO (680) and its Entercom sister stations, Tim Murphy got a big promotion last week: he moves up from VP/GM of the WEEI.com sports site to VP/GM of the entire Entercom cluster. Murphy will continue to focus on Entercom's "digital initiatives," as well as on sales, business activities and engineering/IT. *A surprise format change gave Burlington, VERMONT another top-40 station on Friday. WXZO (96.7 Williston NY) had been running Citadel's "True Oldies Channel" under the nickname "DOT-FM," in an attempt to revive the legacy of Burlington's old WDOT (1400/1390), but it's now "Planet 96.7," with a lineup that includes the syndicated New York City-based Elvis Duran morning show and apparently at least a local midday shift. There's good news and bad news for Burlington TV viewers in outlying areas: the good news is that Dish Network is now carrying at least one Burlington-market signal, CBS affiliate WCAX (Channel 3), to viewers statewide (even in areas that are officially part of the Albany or Boston TV markets); the bad is that the FCC has now deleted at least two analog translators of Burlington stations. W63AD in Rutland and W55AI in Lake Placid, NY both relayed Burlington's WVNY (Channel 22), and we believe both had been off the air for quite some time now. *Another deletion marks the official end of the oldest college station in NEW HAMPSHIRE: Dartmouth College's WDCR (1340 Hanover) signed on in 1958, continuing a history that began with carrier-current broadcasts as early as the 1940s. But with the later addition of an FM station (WFRD 99.3) and a webcast (WebDCR.com), coupled with serious transmitter and ground-system problems, interest in the AM station waned. It fell silent in August 2008, and was resurrected by a group of alumni in the summer of 2009 for just long enough to keep its license alive. *CONNECTICUT is joining what appears to be a New England trend: turning disgraced politicians into radio talk hosts after they've served their prison time. There's Tom Finneran on Boston's WRKO, Buddy Cianci on WPRO in Providence, and now former Connecticut governor John Rowland on Hartford's WTIC (1080). WTIC announced late last week that Rowland and the Rev. Will Marotti will co-host the 3-6 PM weekday afternoon shift, displacing the all-news block that's been airing in drivetime there. Rowland resigned as governor back in 2004, amidst a corruption investigation; he later pleaded guilty and served ten months in federal prison. John Rowland's arrival at WTIC means the end of his wife's radio gig: Patty Rowland had been doing a regular commentary on Brad Davis' talk show at competitor WDRC (1360 Hartford), and that broadcast has now been cancelled. And on TV, add another to the "early riser" club: WFSB (Channel 3) is now starting its morning newscast at 4:30 AM. *Our news from CANADA starts in the Maritimes, where Evanov has named a morning host for its new "Live 105" (CKHY 105.1) in Halifax. It's Cub Carson, who'd been working at CKKL (93.9 Bob FM) in Ottawa, and was formerly morning host at CKQB (106.9 The Bear) there. There's new-station news in Orillia, Ontario, too, where Bayshore Broadcasting's soon-to-launch CISO (Sunshine 89.1) has picked studio space at 490 West Street, just off Highway 11 as it passes through Orillia. Another Cottage Country radio owner, Haliburton, is expanding its reach with the purchase of three more stations. In southwest Ontario, Steve Rae's Raedio, Inc. is selling Haliburton its two stations in Stratford, CHGK (107.7 Mix FM) and CJCS (1240). Rae bought CJCS from Telemedia in 1997 and put CHGK on the air in 2003; financial terms of the sale haven't yet been announced. Haliburton is also adding a station up north: after buying CJJM (99.3 Espanola) from JOCO Communications earlier this year, the company is making another purchase from JOCO, this time picking up bilingual CFSF (99.3 Sturgeon Falls); again, terms haven't been disclosed. And over in TV-land, CTV is once again opening its doors to the public. Last year's open house at CTV facilities in Scarborough and other sites around Canada was meant to build support for a bid to compel cable companies to pay carriage fees to broadcast TV outlets; this year, it's less clear that there's any specific political purpose to the open house, which will take place next Saturday (Sept. 25) at CTV's studios on Channel Nine Court in Scarborough, as well as at CKCO in Kitchener, CJOH/CTV Radio in Ottawa (the old CJOH facility in Nepean is still vacant after that fire earlier this year), CFCF in Montreal and elsewhere in the country. Yup, we've been doing this a long time now, and so we're digging back into the vaults for a look at what NERW was covering one, five, ten and - where available - fifteen years ago this week, or thereabouts. Note that the column appeared on an erratic schedule in its earliest years as "New England Radio Watch," and didn't go to a regular weekly schedule until 1997. Unlike that deal in New York, it appears that at least some of WCRB's airstaff will stay with the new WGBH-run 99.5. Like that deal in New York, it appears that the transaction will move WCRB into WGBH's Allston studios from the longtime WCRB facility in Waltham. And like the New York transition, it appears that the purchase of WCRB will allow WGBH to complete the shift of its main FM facility on 89.7 to full-time news and talk by day, which may explain the recent departure (later in this week's column) of WGBH afternoon classical host Richard Knisely. There's no immediate word on a purchase price for WCRB, which last changed hands in 2006 as part of a complex deal that sent the station's intellectual property to Nassau and its former frequency, 102.5, to Greater Media. In recent months, Nassau has been beset by financial problems, with control of most of its stations passing to a group of lenders led by Goldman Sachs. That lenders' group now holds 100% of WCRB, which has been rumored to be up for sale - and the deal to transfer the station to WGBH closes the book on some strong rumors that had 99.5 becoming part of Entercom's cluster and perhaps flipping to sports as an FM home for WEEI. One of the most familiar sports voices in MASSACHUSETTS has been silenced. "No one I've heard in 45 years of New England residence has ever broadcast anything better than Fred Cusick broadcast hockey," wrote the Boston Globe's Bob Ryan in a tribute this week, and there are few in New England who would disagree with Ryan's assessment of the veteran Bruins announcer who died Tuesday at the age of 90, just hours before he was to be inducted into the Massachusetts Broadcasters Hall of Fame. Cusick started with the Bruins on radio in 1952, and in addition to announcing the games on radio he soon became the driving force behind the team's early TV broadcasts. Under Cusick's leadership, the team began buying time on Sundays (initially on WMUR-TV and WHDH-TV) to broadcast tape-delayed broadcasts of Saturday games. (Cusick was even involved with the editing in those early years.) By 1971, the Bruins games had become a regular part of the schedule on WSBK (Channel 38), and Cusick moved over to the TV booth, where he would remain until he retired from the team in 1997. "Retirement," in this case, was actually something of a misnomer, since Cusick remained active for another five seasons calling games of the AHL's Lowell Lock Monsters. In addition to his Bruins work, which earned him a berth in the Hockey Hall of Fame, Cusick also served as sports director at WEEI in the fifties and sixties, where he worked on early Boston Patriots broadcasts in that team's first few seasons. In NEW YORK City, Bruce Anderson wrapped up a quarter-century of news anchoring at WABC (770) last week. Anderson worked in Michigan (most notably at WWJ in Detroit) before coming to WABC in 1984. Anderson anchored afternoon drive news at WABC from 1993 until he hung up his headphones at the end of Thursday's shift. CBS Radio's WWFS (Fresh 102.7) has dropped its latest morning show. "Dave and Danni" had been together for only a year or so, bringing together Dave Packer (who came to the station in 2007) and former K-Rock jock Danni. A CONNECTICUT broadcasting landmark is being demolished. Broadcast House in downtown Hartford, home to WFSB (Channel 3) from the early sixties until the station moved to Rocky Hill in 2007, is being replaced by a high-rise that will be built by a Middletown-based engineering and architecture firm, AI Engineers. Last week, demolition crews began tearing down the building from the Columbus Boulevard side; the interior of the building had already been gutted. It's far too early to say whether it's a brilliant move or just an interesting dead-end, but the outcome of last week's speculation about the future of The Morey Organization's three NEW YORK FM stations on Long Island's East End is certainly stirring debate within the broadcasting community. The new formats on the three stations are collectively known as "FM ChannelCasting," and the idea - according to TMO - is to bring listeners the same benefits that they'd get from satellite radio, without the expense of buying new equipment or paying a subscription fee. Late last week, active rock WBON (98.5 Westhampton) became rock "FM Channel 98: Long Island Rock", dance/top 40 WDRE (105.3 Calverton-Roanoke) became top 40 "FM Channel 105: Party Hits" and modern rock WLIR (107.1 Hampton Bays) became "FM Channel 107: Neo-Breeze," an unusual (and interesting-sounding) melange of standards, soft AC and smooth jazz. What's new about the stations, though, isn't the music; it's the programming concept: Morey says "FM ChannelCasting" aims to bring listeners the same benefits they get from satellite radio - long sets of music uninterrupted by DJs or commercial breaks - without the costs. In practice, what it amounts to are jockless 15-minute music sweeps, with just one sponsor for an entire hour of programming and very brief sponsor announcements (15 to 30 seconds) four times an hour. Morey says it hopes to lure nontraditional sponsors, even individuals wishing to honor anniversaries and birthdays and such. Meanwhile in Manhattan, it's sounding an awful lot like 1990 at WPLJ (95.5), which announced last week that Rocky Allen and Blain Ensley will return to the air there on Tuesday to resume the afternoon-drive "Showgram" that they did so successfully at 'PLJ more than a decade ago. The move shifts afternooner Race Taylor to middays, displacing Rich Kaminski to weekends. Moving upstate, Double O Radio hopes to add to its dominance in the triangle between Binghamton, Utica and Albany with its $3.8 million deal to buy WDOS (730 Oneonta) and WSRK (103.9 Oneonta) from Ultimate Communications. Double O already owns Oneonta's only other commercial station, WZOZ (103.1), as well as the stations in nearby Norwich, so this move creates quite the cluster along I-88. From NEW JERSEY - or is it PENNSYLVANIA - comes word that Nassau has now taken the inevitable next step in the move of WTHK (97.5) into the Philadelphia market. The former WPST changed city of license from Trenton to Burlington a few weeks back, and now it's applied to move its transmitter from the downtown Trenton site it's called home since the sixties, all the way into Philadelphia. The move comes with some very tight spacing requirements, though: while there's no restriction on spacing to third-adjacent WOGL (98.1), thanks to pre-1964 grandfathering, the relocated WTHK can't increase interference to WIXM (97.3 Millville NJ) or WALK-FM (97.5 Patchogue NY), with which it's also grandfathered, nor can it move much closer to WRVV (97.3 Harrisburg). In MASSACHUSETTS - well, OK, on Long Island, where he actually does the show most of the time, "Jay Severin Has Issues." That's the name of the syndicated afternoon show that the WTKK (96.9 Boston) talker will be doing for Infinity beginning in January, but it's also a pretty good description of what the last week was like for him. It seems Severin told a caller that he'd won a Pulitzer Prize for online journalism, which raised some questions a few doors down at the Boston Globe. Columnist Scot Lehigh investigated, and found that MSNBC.com, for which Severin used to write, had won a couple of Online Journalism Awards, which were awarded by Columbia University, which also awards the Pulitzers...and there's now some frantic "what I meant to say was" backtracking going on. To the east of Toronto, CKDO (1350 Oshawa) is asking the CRTC for permission to move up the dial to 1580, where it would run 10 kW fulltime (up from the current 10 kW day/5 kW night). The 1580 frequency was where CHUC (1450 Cobourg) was going to move, but now CHUC is headed to the FM dial instead. This week's big news from NEW YORK was, of course, the end of a 75-year tradition at WOR (710), as John R. Gambling parted ways with the station that employed his grandfather, John B., and his father, John A., as hosts of "Rambling With Gambling" weekday mornings. The younger Gambling had hosted the show solo for the last decade. He tells the New York papers that he could have stayed at WOR until the end of his contract in December, but chose to leave with a farewell show that aired last Monday (9/11) on short notice. No replacement has been named yet, and WOR is showing the unusual grace of letting its listeners openly discuss the end of the Gambling dynasty on the air. Where next for John R.? The rumor mill is pointing towards WEVD (1050), as that station struggles for respect as a talk outlet. Moving upstate, WOFX is the new set of calls for Troy's AM 980, the first call change there in the station's history. (The WTRY calls live on at 98.3 FM in Rotterdam, along with the oldies format that had been simulcast on both outlets for years). Now a sports outlet, WOFX will offer Imus, Jim Rome, and Fox Sports Radio to the Capital District. Syracuse's big country station, WBBS (104.7 Fulton), can breathe easy -- it's not being challenged by Galaxy Broadcasting after all. The "Big Cow" stunt on WRDS (102.1 Phoenix) last weekend lasted just a day before the former urban station was relaunched (at 8 AM last Monday, 9/11) as "Sunny 102," variously described to NERW as an AC outlet and as a classic hits station. Whatever it's playing, the new Sunny has Bill Baker as morning man, returning home to Syracuse (where he was WSYR 570's morning host for years) from a stint down in Richmond. Speaking of obituaries, a broadcaster who left his mark on MASSACHUSETTS radio died last month down in Florida. Richard M. Fairbanks took Framingham's WKOX from a kilowatt daytimer to a major local voice in the MetroWest area, and helped make FM a force in the Boston market in the early seventies by flipping WKOX-FM to rock as WVBF (105.7), named for his wife Virginia B. Fairbanks. Fairbanks Broadcasting was founded way back in 1948 to purchase WIBC (1070) in Indianapolis. Fairbanks (who was the last surviving grandson of Teddy Roosevelt's vice president, Charles W. Fairbanks) sold most of his properties in the last decade, leaving just WKOX in his portfolio at the end. He was 88 when he died August 11 at his home in Key Largo. Funeral services were held in Indianapolis August 13.